Orion will rise high in the southern winter sky this week, at around 8 p.m., when you can spot the two bright but very different stars, Rigel and Betelgeuse. 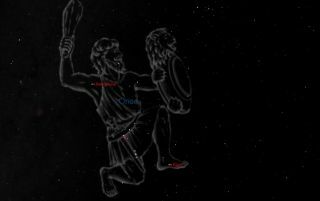 Orion, the Mighty Hunter, will stand upright, high in our southern sky at around 8 p.m. this week, glittering like a large piece of celestial jewelry. Shining down upon us all winter long, Orion is the brightest and grandest of the constellations. Three bright stars line up in the middle of a bright rectangle to decorate Orion's belt, which points northward to the orange star, Aldebaran, as well as the star clusters of the Hyades and Pleiades of Taurus, and southward to the brightest of all stars, the Dog Star Sirius. If there were ever a pair of stars to designate as the "Odd Couple" of the sky, then Rigel and Betelgeuse are certainly that pair. While both are very large, they seem to be at two entirely different periods in a star's existence. The majority of stars, including the sun, fit along a spectrum called the main sequence. Main sequence stars vary widely in effective temperature but the hotter they are, the more luminous they are. These stars are fusing hydrogen to helium in their cores. Stars spend the bulk of their existence as main sequence stars. Other major groups of stars are the giants and supergiants; luminous stars that have evolved off the main sequence. Rigel and Betelgeuse are two such supergiant stars — but otherwise, they couldn't be more different. Let's first look at Rigel (the "Left Leg of the Giant"). Here we find a star apparently reaching the prime of its life. Located 863 light-years away, its computed luminosity is roughly equal to approximately 120,000 times the brightness of the sun. It's a true supergiant: a blazing white-hot star of intense brilliance and dazzling beauty that's one of the rarest breeds in our galaxy. But with their enormous brilliance these stars remain conspicuous over great distances. Betelgeuse ("The Armpit of the Giant"), in contrast, is near the end of its career. It shines with a cool, dull ruddy hue and is located 640 light-years away — one of the largest and most luminous naked-eye stars. Rather than shining with a steady light, it pulsates irregularly: as it nears the end of its life, it expands and contracts spasmodically. Incredibly, the star's diameter can vary between about 500 and 900 times the diameter of the sun, but the pulsations are so irregular that no one can predict exactly when it will expand or contract. In trying to describe Betelegeuse more than half a century ago, Henry Neeley, a lecturer at New York's Hayden Planetarium, noted that it is "like an old man with his strength almost entirely spent, panting in the asthmatic decrepitude of old age." Red supergiants like Betelgeuse are gigantic bloated globes of cooler gas. If such a star were to replace the sun in the solar system, it might extend beyond Mars' orbit. At first, stars produce energy by fusing hydrogen into helium in their cores. Eventually, they accumulate enough helium to start fusing that instead, which increases their energy output drastically. At that point, it swells up into a red giant or supergiant like Betelgeuse. Rigel, too, will undergo this process in a few million years. Those old stars' cores produce heavier and heavier elements as they're crushed by gravity — but once they create iron, they've reached the beginning of the end. Instead of generating energy, forming elements heavier than iron consumes energy, and such a star will soon no longer be able to resist the pull of gravity on its immense weight. Finally, it will collapse, triggering a cataclysmic supernova explosion. Betelgeuse could reach this point, or at least its light could reach Earth, within just a million years. Joe Rao serves as an instructor and guest lecturer at New York's Hayden Planetarium. He writes about astronomy for Natural History magazine, the Farmers' Almanac and other publications, and he is also an on-camera meteorologist for Fios1 News in Rye Brook, New York. Follow us @Spacedotcom, Facebook and Google+. Originally published on Space.com.